“Between every two pines is a doorway to a new world. “Wrote John Muir, an avid mountaineer and naturalist. Tall Trees Resort is one such world. 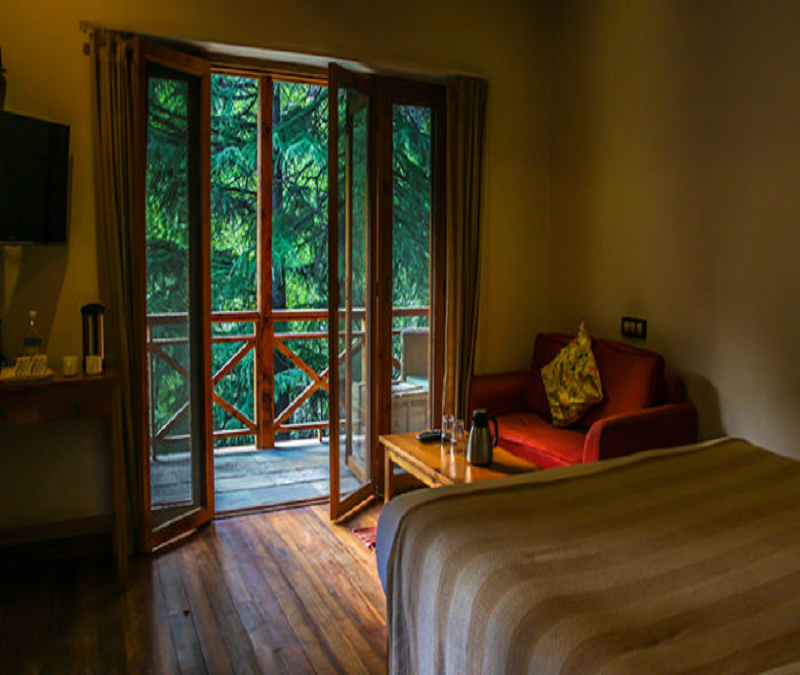 About 15 kms away from the tourist town of Manali Tall Trees Resort offers an experience to remember. In the heart of a pine forest, next to the River Beas and surrounded by the majestic Himalayas this resort incorporates every element of nature graciously. The quaint cottages are comfortable and well furnished with balconies overlooking the landscaped garden and stream that flows through the resort. The campsite is on the banks of the river about a 15 minutes hike through a lush green pine forest. It is an ideal place for travellers to sit back, relax and introspect. Hadimba Temple: Nestled in thick lush forests and located a mere 3 kilometres from the New Manali Chowk, this world-famous temple is dedicated to Hadimba Mata, the wife of the Pandava Bhim of the epic Mahabharata. This awe-inspiring structure was built over five centuries ago and has been lovingly maintained by the local folks since that time. An adjoining Temple dedicated to the Deity’s son, Ghatotkach, is built at a site not walking distance away from the holy temple. The Hadimba Temple also attracts visitors from all parts of the world for its locally known Dhungri Mela. Seven days of boisterous celebrations take place, highlighting the local culture and the devotion these deities inspire. Vashisht: This remote village and its namesake Temple were established by Maharishi Vashisht, Guru to the Young Lord Ram and his brothers. The village was established by the Vashisht Clan and is especially famous for its Sulphur hot springs. These springs are rumoured to possess great healing properties, and are frequented by both locals, as well as tourists. Naggar: Naggar is located at a distance of approximately 20 kms from Manali and was once the Royal Capital of the erstwhile kings for over 1400 years. The Naggar Castle was built over 500 years ago and was the official seat of Kings. Also famous in its own right, the world-renowned Roerich Art Gallery is housed here and was established by Sir Nicholas Roerich, a reputed Russian artist, who spent his last years in this small hamlet, and whose teachings are still passed down to young artists and art enthusiasts alike. Solang Valley: Solang Valley is a famous local adventure spot located about 13 kms from Manali, where a number of mountain adventure sports are conducted and can be experienced here. This beautiful hamlet plays host to zorbing, paragliding, ATV rides and many other activities in the summer. In winters, this otherwise lush meadow transforms into a white wonderland and various skiing, snowboarding and other snow events are held here. Rohtang Pass: Rohtang Pass is an ancient path which connects the culturally diverse valleys of Primarily Buddhist Lahaul and Spiti Valley, and the Hindu Valley of Gods, Kullu Valley. This pass is located at a height of over 13000 feet, and is famous for its snow points, which are laden with snow many feet in height, even during the peak of summer. Rohtang, or ‘pile of corpses’ in its original lahauli translation, is so morbidly named, after the many who lost their lives over the years, attempting to cross the pass. The pass still manages a death count even today, which has prompted the local Government to build a Tunnel, providing passage to the northward regions of Lahaul Spiti, and further ahead, Leh Ladakh. Arjun Cave: This cave is a well-known tourist spot near Manali above the village of Prini. According to legend one the Pandav brothers Arjuna meditated in the cave and acquired the Pashupata Ashtra or the weapon of Lord Indra. Regardless of one’s belief in the myth this place is worth visiting simply for its natural beauty and the panoramic view of the snow-clad Himalayan peaks. Categories Rooms: The Resort has a variety of room categories to choose from. Superior Double or Twin Rooms: All the rooms are spacious and well ventilated. They all have an attached outside sitting area, providing a fantastic view of the well-maintained garden and the stream that flows through the resort. Cottage Rooms: The rooms are well maintained and spacious. They provide an excellent view of the well-manicured garden as well as the adjoining Beas River. Luxury Tents: The tents are spacious and comfortable. There is a bathroom attached and the tent itself has an indoor sitting area. 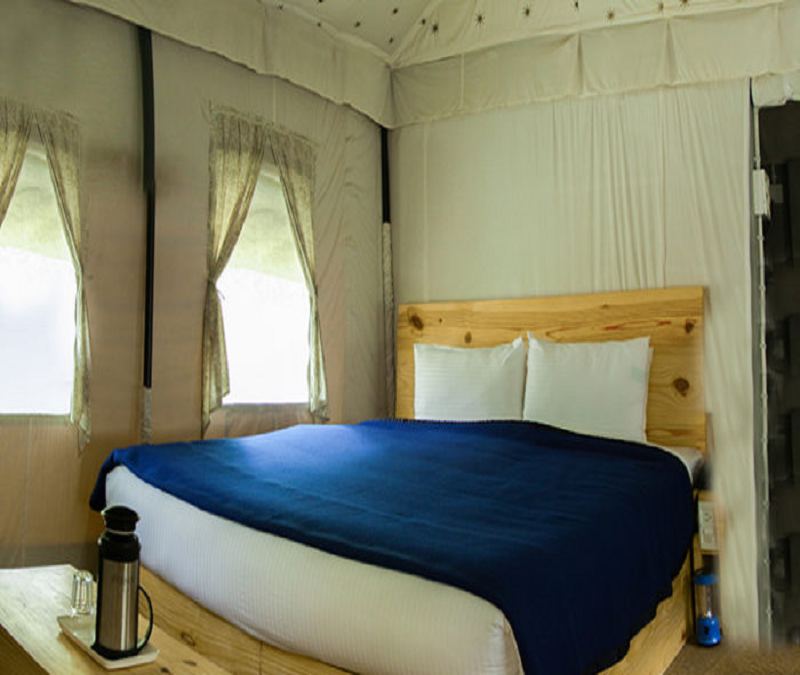 Deluxe Tents: The tents are comfortable and well aired. Guests travelling by bus should ask to get dropped at 15 Mile Bridge, where we can provide pick-up, or alternatively guide the guests to the property. Guests travelling by car/SUV can follow the NH-21 from Patlikuhal and turn at the 15 Mile Bridge, approximately 15 kilometres from Manali. From here, guests should be able to see our signboards and follow them all the way to the hotel. If the guests like, we can send a member of our staff to the 15 Mile Bridge to guide you rest of the way. Guests travelling in Tempo Travellers and large vehicles can turn towards Naggar from Patlikuhal and follow the left bank road for about 5 kilometres. Once the guests reach Sarsai village, they can turn left on to the Batahar road. Our signboard can be seen on the other side of the road and is visible to all. A member of our staff will meet you there and guide you to the property. Getting There You can reach out to Normal at 96256 60200 for any queries you have for directions and coordination. Our resort is located right next to the famous 15 Mile Bridge about 20 minutes before Manali. You can locate us on google maps here. ​If you are coming from Bhuntar Airport: A pick up to our resort can be arranged on prior notice. You can choose this as an add on while making the reservations. If you go ahead with this, please share your confirmed flight bookings with us . If you are coming by volvo: You will be arriving via the main highway NH 21. Please tell the conductor beforehand that you will be getting off at the famous 15 Miles Bridge, so that he can put your luggage last. You will be picked up from the bridge by our staff. ​If you are coming by your own vehicle: Take the main highway NH 21 from Kullu towards Manali. Our resort is about 45 minutes from Kullu. On your way you will cross Raison, Dhobi​, Katrain​ and Patlikuhal, just keep following the signboards towards Manali. Right after Patlikuhal, you will find big green signboard of our resort. From Patlikuhal, if you have a smaller car than Innova – Continue straight, you will cross Span resorts ​on your right. We are about 5 minutes from Span. In the meantime, somebody from our resort will​​ call you and will​ be waiti​ng ​to guide ​you​ towards our resort. ​If you have a bigger car than Innova – After reaching Patlikuhal, instead of going straight turn right towards Naggar. After reaching Naggar, keep moving towards Manali. Our resort is about 20 minutes from this point. On your way you will cross Heritage Vilage, John Wesley School on your left side and Sarsai Village. At Sarsai Village, somebody from our resort will​ call you and will​ be waiti​ng ​to guide ​you​towards our resort.